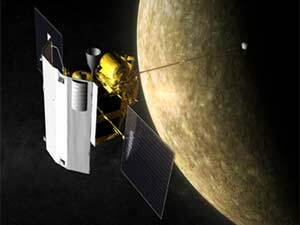 Artist's impression of the MErcury Surface, Space ENvironment, GEochemistry, and Ranging (MESSENGER) spacecraft in orbit at Mercury. 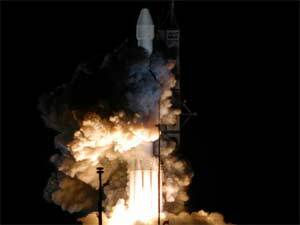 MESSENGER launched from Cape Canaveral Air Force Station, Fla., on Aug. 3, 2004, and will begin a yearlong orbital study of Mercury in March 2011. The tip of the Boeing Delta II rocket with its MESSENGER spacecraft on top breaks through the billows of smoke below as it lifts off on August 3, 2004, at 2:15:56 a.m. EDT from Launch Pad 17-B, Cape Canaveral Air Force Station.